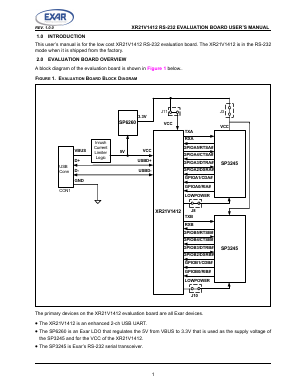 This userâs manual is for the low cost XR21V1412 RS-232 evaluation board. The XR21V1412 is in the RS-232 mode when it is shipped from the factory. A block diagram of the evaluation board is shown in Figure 1 below.. The primary devices on the XR21V1412 evaluation board are all Exar devices. â¢ The XR21V1412 is an enhanced 2-ch USB UART. as the supply voltage of the SP3245 and for the VCC of the XR21V1412. â¢ The SP3245 is Exarâs RS-232 serial transceiver.